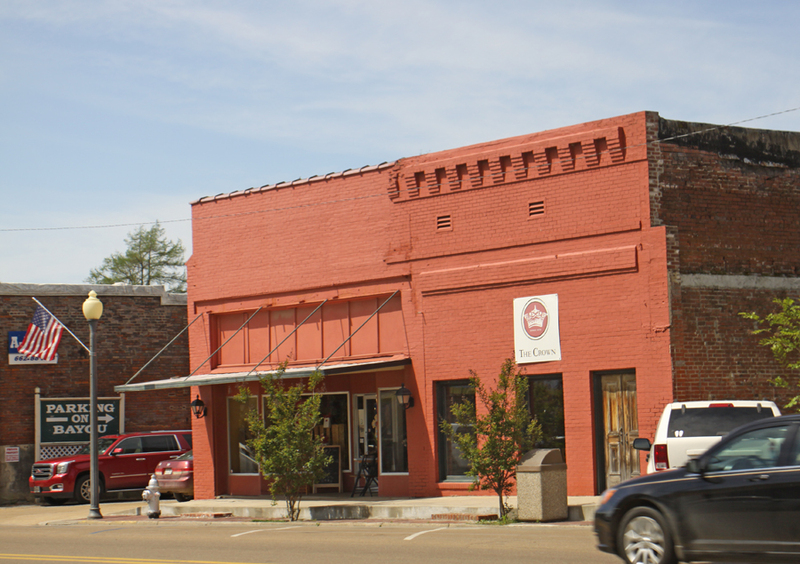 The Crown in Indianola, Mississippi is a lot more than a restaurant. they also bill themselves as "an Art Gallery full of fabulous original Delta art, a Gift Shop filled with classic children's toys and gifts for every occasion and a Bookstore." You could browse for hours but we came to dine so the browsing was limited. While there, I had to sample some of their "Taste of Gourmet" items. After sampling a few, I settled on the Delicious Dill Dip Mix. Taste of Gourmet is a line of products developed by the Roughton family from the food served at The Crown, now a second generation family restaurant. The story behind The Crown is a convoluted journey from then to now. In 1972 Evelyn and Tony Roughton opened an antique mall here in Indianola. Then in 1976 they opened the Crown Tea Room, to draw more shoppers in by serving lunch and afternoon tea. Jennifer Roughton Schaumburg was our host for lunch when we visited on a Delta Press Trip. She really treated us right. Our waitress had piping hot small loaves of bread on our table as soon as we were seated. The decor was filled with great art and had a friendly feeling. The desert bar is not fancy but oh so delicious. It's set up right in the dining room so as soon as you finish your entree, you can dig into some really yummy sweet treats. There were half a dozen choices including an English Trifle and a Chess Pie. I opted for the pecan pie, always one of my favorites. I wasn't disappointed . It had a really homemade taste that made me pretty sure those pecans had come from trees right here in Mississippi. I'm in good company when I say The Crown will treat you like royalty. It has been featured on Bobby Flay's Food Nation, Turner South, The Travel Channel and on CNN! and in Southern Living Magazine, Saveur, Bon Appetite, The New York Times and others. They are very close to the B.B. King Museum so it is a perfect stop if you are visiting there. Place cheese, butter, mayonnaise, onion, Worcestershire and Tabasco in a bowl and mix thoroughly. Butter mixture may be made 24 hours ahead and kept refrigerated. Poach the catfish fillets in lightly simmering water for 4 to 5 minutes. Gently lift the fillets from the water and set aside to drain. For individual servings, place the fillets in au gratin dishes and cover with 2 tablespoons of the cheese mixture. Broil for 2 to 3 minutes until the cheese mixture browns. Without individual dishes, place fillets on a lightly greased baking dish. Cover each fillet with the cheese mixture and brown under the broiler. Carefully lift the fillets from the dish onto the plates and spoon some of the pan juices over each serving.